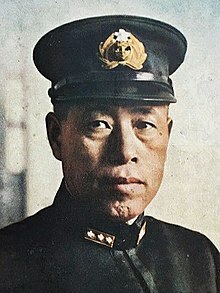 Isoroku Yamamoto (山本 五十六, Yamamoto Isoroku, April 4, 1884 – April 18, 1943) was a Japanese Fleet Admiral of the Imperial Japanese Navy and the commander-in-chief of the Combined Fleet during World War II until his death. Yamamoto held several important posts in the Imperial Japanese Navy (IJN), and undertook many of its changes and reorganizations, especially its development of naval aviation. He was the commander-in-chief during the early years of the Pacific War and oversaw major engagements including the attack on Pearl Harbor and the Battle of Midway. He was killed when American code breakers identified his flight plans, enabling the United States Army Air Forces to shoot down his plane. His death was a major blow to Japanese military morale during World War II. Yamamoto was born Isoroku Takano (高野 五十六, Takano Isoroku) in Nagaoka, Niigata. His father was Sadayoshi Takano (高野 貞吉), an intermediate-rank samurai of the Nagaoka Domain. "Isoroku" is an old Japanese term meaning "56"; the name referred to his father's age at Isoroku's birth. In 1916, Isoroku was adopted into the Yamamoto family (another family of former Nagaoka samurai) and took the Yamamoto name. It was a common practice for samurai families lacking sons to adopt suitable young men in this fashion to carry on the family name, the rank and the income that comes with it. In 1918 Isoroku married Reiko Mihashi, with whom he had two sons and two daughters. Yamamoto was part of the Japanese Navy establishment, who were rivals of the more aggressive army establishment, especially the officers of the Kwantung Army. As such, he promoted a policy of a strong fleet to project force through gunboat diplomacy, rather than a fleet used primarily for transport of invasion land forces, as some of his political opponents in the army wanted. This stance led him to oppose the invasion of China. He also opposed war against the United States partly because of his studies at Harvard University (1919–1921) and his two postings as a naval attaché in Washington, D.C., where he learned to speak fluent English. Yamamoto traveled extensively in the United States during his tour of duty there, where he studied American customs and business practices. He was promoted to captain in 1923. On February 13, 1924, at the rank of captain, he was part of the Japanese delegation visiting the US Naval War College. Later that year, he changed his specialty from gunnery to naval aviation. His first command was the cruiser Isuzu in 1928, followed by the aircraft carrier Akagi. Should hostilities once break out between Japan and the United States, it would not be enough that we take Guam and the Philippines, nor even Hawaii and San Francisco. To make victory certain, we would have to march into Washington and dictate the terms of peace in the White House. I wonder if our politicians [who speak so lightly of a Japanese-American war] have confidence as to the final outcome and are prepared to make the necessary sacrifices. This quote was spread by the militarists, minus the last sentence, where it was interpreted in America as a boast that Japan would conquer the entire continental United States. The omitted sentence showed Yamamoto's counsel of caution towards a war that could cost Japan dearly. Nevertheless, Yamamoto accepted the reality of impending war and planned for a quick victory by destroying the United States Pacific Fleet at Pearl Harbor in a preventive strike while simultaneously thrusting into the oil and rubber resource-rich areas of Southeast Asia, especially the Dutch East Indies, Borneo, and Malaya. In naval matters, Yamamoto opposed the building of the super-battleships Yamato and Musashi as an unwise investment of resources. In January 1941, Yamamoto went even further and proposed a radical revision of Japanese naval strategy. For two decades, in keeping with the doctrine of Captain Alfred T. Mahan, the Naval General Staff had planned in terms of Japanese light surface forces, submarines, and land-based air units whittling down the American Fleet as it advanced across the Pacific until the Japanese Navy engaged it in a climactic "decisive battle" in the northern Philippine Sea (between the Ryukyu Islands and the Marianas), with battleships meeting in the traditional exchange between battle lines. As the U.S. and Japan were officially at peace and continued diplomatic negotiations, the First Air Fleet of six carriers attacked the U.S. on December 7, 1941, launching 353 aircraft against Pearl Harbor and other locations within Honolulu in two waves. The attack was a complete success according to the parameters of the mission, which sought to sink at least four American battleships and prevent the U.S. from interfering in Japan's southward advance for at least six months. American aircraft carriers were also considered a choice target, but these were not in port at the time of the attack. In the end, five American battleships were sunk, three were damaged, and eleven other cruisers, destroyers, and auxiliaries were sunk or seriously damaged, 188 American aircraft were destroyed and 159 others damaged, and 2,403 people were killed and 1,178 others wounded. The Japanese lost 64 servicemen and only 29 aircraft, with 74 others damaged by anti-aircraft fire from the ground. The damaged aircraft were disproportionately dive and torpedo bombers, seriously impacting available firepower to exploit the first two waves' success, so the commander of the First Air Fleet, Naval Vice Admiral Chuichi Nagumo, withdrew. Yamamoto later lamented Nagumo's failure to seize the initiative to seek out and destroy the U.S. carriers, absent from the harbor, or further bombard various strategically important facilities on Oahu. Nagumo had absolutely no idea where the American carriers might be, and remaining on station while his forces cast about looking for them ran the risk of his own forces being found first and attacked while his aircraft were absent searching. In any case, insufficient daylight remained after recovering the aircraft from the first two waves for the carriers to launch and recover a third before dark, and Nagumo's escorting destroyers lacked the fuel capacity for him to loiter long. Much has been made of Yamamoto's hindsight, but, in keeping with Japanese military tradition not to criticize the commander on the spot, he did not punish Nagumo for his withdrawal. On the strategic, moral, and political level, the attack was a disaster for Japan, rousing American passions for revenge due to what is now famously coined a "sneak attack". The shock of the attack, coming in an unexpected place with devastating results and without a declaration of war, galvanized the U.S. public's determination to avenge the attack. When asked by Prime Minister Fumimaro Konoe in mid-1941 about the outcome of a possible war with the United States, Yamamoto made a well-known and prophetic statement: If ordered to fight, he said, "I shall run wild considerably for the first six months or a year, but I have utterly no confidence for the second and third years." His prediction would be vindicated, as Japan easily conquered territories and islands in Asia and the Pacific for the first six months of the war, before suffering a major defeat at the Battle of Midway on June 4–7, 1942, which ultimately tilted the balance of power in the Pacific towards the U.S.
As a strategic blow intended to prevent American interference in the Dutch East Indies for six months, the Pearl Harbor attack was a success, but unbeknownst to Yamamoto, it was a pointless one. In 1935, in keeping with the evolution of War Plan Orange, the U.S. Navy had abandoned any intention of attempting to charge across the Pacific towards the Philippines at the outset of a war with Japan. In 1937, the U.S. Navy had further determined even fully manning the fleet to wartime levels could not be accomplished in less than six months, and myriad other logistic assets needed to execute a trans-Pacific movement simply did not exist and would require two years to construct after the onset of war. In 1940, U.S. Chief of Naval Operations, Admiral Harold Stark had penned a Plan Dog memorandum, which emphasized a defensive war in the Pacific while the US concentrated on defeating Nazi Germany first, and consigned Admiral Husband Kimmel's Pacific Fleet to merely keeping the Imperial Japanese Navy (IJN) out of the eastern Pacific and away from the shipping lanes to Australia. Moreover, it is questionable whether the US would have gone to war at all had Japan attacked only British and Dutch possessions in the Far East. Plans included ideas as ambitious as invading India or Australia, or seizing Hawaii. These grandiose ventures were inevitably set aside as the army could not spare enough troops from China for the first two, which would require a minimum of 250,000 men, nor shipping to support the latter two. (Shipping was allocated separately to the IJN and IJA, and jealously guarded.) Instead, the Imperial General Staff supported an army thrust into Burma in hopes of linking up with Indian Nationalists revolting against British rule, and attacks in New Guinea and the Solomon Islands designed to imperil Australia's lines of communication with the United States. Yamamoto argued for a decisive offensive strike in the east to finish off the US fleet, but the more conservative Naval General Staff officers were unwilling to risk it. The Port Moresby (MO) Operation proved an unwelcome setback. Although Tulagi and Guadalcanal were taken, the Port Moresby invasion fleet was compelled to turn back when Takagi clashed with a US carrier task force in the Battle of the Coral Sea in early May. Although the Japanese sank the US carrier USS Lexington and damaged the USS Yorktown (CV-5), the Americans damaged the carrier Shōkaku so badly that she required dockyard repairs, and the Japanese lost the light carrier Shoho. Just as importantly, Japanese operational mishaps and US fighters and anti-aircraft fire devastated the dive bomber and torpedo plane formations of both Shōkaku's and Zuikaku's air groups. These losses sidelined Zuikaku while she awaited replacement aircraft and aircrews, and saw to tactical integration and training. These two ships would be sorely missed a month later at Midway. This plan was long believed to have been to draw American attention—and possibly carrier forces—north from Pearl Harbor by sending his Fifth Fleet (two light carriers, five cruisers, 13 destroyers, and four transports) against the Aleutians, raiding Dutch Harbor on Unalaska Island and invading the more distant islands of Kiska and Attu. The plan was a compromise and hastily prepared, apparently so it could be launched in time for the anniversary of Tsushima, but appeared well thought out, well organized, and finely timed when viewed from a Japanese viewpoint. Against four carriers, two light carriers, 11 battleships, 16 cruisers and 46 destroyers likely to be in the area of the main battle the US could field only three carriers, eight cruisers, and 15 destroyers. The disparity appeared crushing. Only in numbers of carrier decks, available aircraft, and submarines was there near parity between the two sides. Despite various mishaps developed in the execution, it appeared that—barring something unforeseen—Yamamoto held all the cards. Unbeknownst to Admiral Yamamoto, the US had learned of Japanese plans thanks to the code breaking of Japanese naval code D (known to the US as JN-25). As a result, Admiral Chester Nimitz, the Pacific Fleet commander, was able to circumvent both of Yamamoto's security measures and place his outnumbered forces in a position to conduct an ambush. By Nimitz's calculation, his three available carrier decks, plus Midway, gave him rough parity with Nagumo's First Mobile Force. Following a nuisance raid by Japanese flying boats in May, Nimitz dispatched a minesweeper to guard the intended refueling point for Operation K near French Frigate Shoals, causing the reconnaissance mission to be aborted and leaving Yamamoto ignorant of whether Pacific Fleet carriers were still at Pearl Harbor. It remains unclear why Yamamoto permitted the earlier attack, and why his submarines did not sortie sooner, as reconnaissance was essential to success at Midway. Nimitz also dispatched his carriers toward Midway early, and they passed the intended picket line force of submarines en route to their station, negating Yamamoto's back-up security measure. Nimitz's carriers positioned themselves to ambush the Kidō Butai (striking force) when it struck Midway. A token cruiser and destroyer force was sent toward the Aleutians, but otherwise Nimitz ignored them. On June 4, 1942, days before Yamamoto expected them to interfere in the Midway operation, US carrier-based aircraft destroyed the four carriers of the Kidō Butai, catching the Japanese carriers at an especially vulnerable moment. With his air power destroyed and his forces not yet concentrated for a fleet battle, Yamamoto maneuvered his remaining forces, still strong on paper, to trap the US forces. He was unable to do so because his initial dispositions had placed his surface combatants too far from Midway, and because Admiral Raymond Spruance prudently withdrew to the east in a position to further defend Midway Island, believing (based on a mistaken submarine report) the Japanese still intended to invade. Not knowing several battleships, including the powerful Yamato, were on the Japanese order of battle, he did not comprehend the severe risk of a night surface battle, in which his carriers and cruisers would be at a disadvantage. However, his move to the east did avoid the possibility of such a battle taking place. Correctly perceiving he had lost and could not bring surface forces into action, Yamamoto aborted the invasion of Midway and withdrew. The defeat marked the high tide of Japanese expansion. Yamamoto's plan for Midway Island has been the subject of much criticism. Some historians state it violated the principle of concentration of force, and was overly complex. Others point to similarly complex Allied operations, such as Operation MB8, that were successful, and note the extent to which the US intelligence coup derailed the operation before it began. Had Yamamoto's dispositions not denied Nagumo adequate pre-attack reconnaissance assets, both the American cryptanalytic success and the unexpected appearance of the American carriers would have been irrelevant. The crash site and body of Yamamoto were found the next day in the jungle of the island of Bougainville by a Japanese search and rescue party, led by army engineer Lieutenant Hamasuna. According to Hamasuna, Yamamoto had been thrown clear of the plane's wreckage, his white-gloved hand grasping the hilt of his katana, still upright in his seat under a tree. Hamasuna said Yamamoto was instantly recognizable, head dipped down as if deep in thought. A post-mortem of the body disclosed that Yamamoto had received two 0.50-caliber bullet wounds, one to the back of his left shoulder and another to his left lower jaw that exited above his right eye. The Japanese navy doctor examining the body determined that the head wound killed Yamamoto. The more violent details of Yamamoto's death were hidden from the Japanese public. The medical report was whitewashed, changed "on orders from above", according to biographer Hiroyuki Agawa. Yamamoto's staff cremated his remains at Buin and his ashes were returned to Tokyo aboard the battleship Musashi, Yamamoto's last flagship. Yamamoto was given a full state funeral on June 5, 1943, where he received, posthumously, the title of Marshal and was awarded the Order of the Chrysanthemum (1st Class). He was also awarded Nazi Germany's Knight's Cross of the Iron Cross with Oak Leaves and Swords. Some of his ashes were buried in the public Tama Cemetery, Tokyo (多摩霊園) and the remainder at his ancestral burial grounds at the temple of Chuko-ji in Nagaoka City. He was succeeded as commander-in-chief of the Combined Fleet by Admiral Mineichi Koga. Yamamoto practiced calligraphy. He and his wife, Reiko, had four children: two sons and two daughters. Yamamoto was an avid gambler, enjoying Go, shogi, billiards, bridge, mah jong, poker, and other games that tested his wits and sharpened his mind. He frequently made jokes about moving to Monaco and starting his own casino. He enjoyed the company of geisha, and his wife Reiko revealed to the Japanese public in 1954 that Yamamoto was closer to his favorite geisha Kawai Chiyoko than to her, which stirred some controversy. His funeral procession passed by Kawai's quarters on the way to the cemetery. In the 2001 film Pearl Harbor, Yamamoto was portrayed by Oscar-nominated Japanese-born American actor Mako Iwamatsu. Like Tora! Tora! Tora!, this film also features the sleeping giant quote. In Toei's 2011 war film Rengō Kantai Shirei Chōkan: Yamamoto Isoroku, Yamamoto was portrayed by Kōji Yakusho. In the 2004 anime series Zipang, Yamamoto (voiced by Bunmei Tobayama) works to develop the uneasy partnership with the crew of the JMSDF Mirai, which has been transported back sixty years through time to the year 1942. In Neal Stephenson's 1999 book Cryptonomicon, Yamamoto's final moments are depicted, with him realising Japan's naval codes have been broken and he must inform headquarters. ^ Pricer, Douglas (2014). Cornerstones of Courage: The Story of Ssgt. William J. Bordelon, USMC. Xlibris. p. 73. ISBN 1499012519. ^ Mark Stille (June 20, 2012). Yamamoto Isoroku. Bloomsbury Publishing. p. 59. ISBN 978-1-84908-732-2. ^ Stille, Mark (2012). "The Early Years". Yamamoto Isoroku. Osprey Publishing. ISBN 1849087318. ^ Davis, Donald (2006). Lightning Strike: The Secret Mission to Kill Admiral Yamamoto and Avenge Pearl Harbor. St. Martin's Griffin;. p. 38. ISBN 0312309074. ^ "1920–1929". Chronology of Courses and Significant Events. U.S. Naval War College. Retrieved May 29, 2010. ^ a b c d e f g h Hoyt, Edwin P (1990). Yamamoto: The Man Who Planned Pearl Harbor. New York: McGraw-Hill. ISBN 978-1-58574-428-2. Retrieved March 26, 2017. ^ "December 7, 1941: Pearl Harbor Casualties". PearlHarbor.org. Retrieved April 10, 2019. ^ Lightbody, Bradley (2003). "Part 5 – Containment". The Second World War (1st ed.). London: Routledge. p. 136. ISBN 0-415-22404-7. ^ a b Kennedy, David M. (March 1999). "Victory at Sea". The Atlantic (March 1999). The Atlantic. Retrieved January 29, 2018. ^ Gamble, Bruce (2010). Fortress Rabaul: The Battle for the Southwest Pacific, January 1942 – April 1943. Zenith Imprint. p. 343. ISBN 978-0-7603-2350-2. ^ Taiheiyô no washi (1953). IMDB.com. ^ Aa, kaigun (1970). IMDB.com. ^ Gateway to Glory (1970). Turner Classic Movies. Parillo, Mark (2006). "The United States in the Pacific". In Higham, Robin; Harris, Stephen (eds.). Why Air Forces Fail: the Anatomy of Defeat. The University Press of Kentucky. ISBN 978-0-8131-2374-5. Wikimedia Commons has media related to Isoroku Yamamoto.